Take Democrat Susan Wild, who is running in the open-seat race in Pennsylvania’s redrawn 7th District. She won a crowded primary in May, and had only $51,000 in the bank at the end of her pre-primary period on April 25. But by the end of the second quarter on June 30, her campaign had more than 13 times as much money, ending with $700,000 on hand. House Republicans haven’t had to worry as much about expensive primaries because they are largely on defense this cycle as the majority party. In other words, they are focused on defending their incumbents rather than competing in crowded primaries to take on sitting Democrats. A handful of Republicans in open seats — or incumbents who faced intraparty challengers — have gone through costly primaries. And while most have replenished their campaign funds since, they’ve done so at a slower rate than Democratic challengers. Republicans are confident their incumbents will have the financial advantage to mitigate the Democratic fundraising surge — not to mention all of the money that outside groups will dump into competitive races. But the huge amounts raised by Democratic candidates, and early signs they’re recovering from costly primaries, have the party excited that it can win back the House in November. Two figures help illustrate whether candidates have been successful at digging out from costly primaries. The first is the cash on hand on their pre-primary fundraising report, filed shortly before the primary election. And the second is their cash on hand at June 30, the end of the second fundraising quarter. The candidates analyzed included those whose races Inside Elections with Nathan L. Gonzales rates as competitive. Of those House contests that have seen competitive primaries so far, 30 Democratic nominees spent six figures or more on their primaries. Nine Republican nominees, including two incumbents, also spent sizable amounts on their primaries. These Democrats listed an average of $363,000 in cash on hand in their pre-primary fundraising reports, while Republicans reported an average of $405,000. By June 30, the average amount in the bank for these Democrats had more than doubled to $741,000, compared to $412,000 for Republicans, a nearly 2 percent increase. The individual candidate figures vary depending on the timing of their primaries. 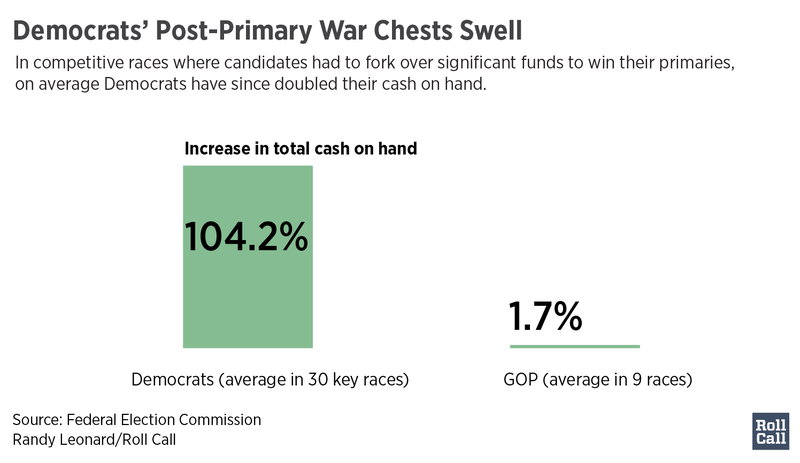 Some candidates whose primaries occurred in May had more time to replenish their campaign war chests, while others with June primaries only had a few weeks or days before the quarter ended. Three of the 30 Democrats and three of the nine Republicans saw a decrease in cash on hand at the second quarter’s end compared to the pre-primary reports. On the Democratic side, New York lawyer Antonio Delgado saw a dip in his cash balance after he won a June 26 primary to take on GOP Rep. John J. Faso. Two California Democrats, Jessica Morse and Harley Rouda, also saw decreases. Rouda had to wait for several weeks after the close June 5 primary before the race was called. Among Republicans, New York Rep. Dan Donovan had less cash on hand at June 30 after a costly primary against former Rep. Michael G. Grimm. Texas Republican Chip Roy, who is running in the open 21st District, and New Jersey state Assemblyman Jay Webber, who is running in the open 11th District, also saw drops in campaign cash. Despite varying figures by district, the overall trend has Democrats confident the energy fueling their campaign donations is sustainable heading into November. 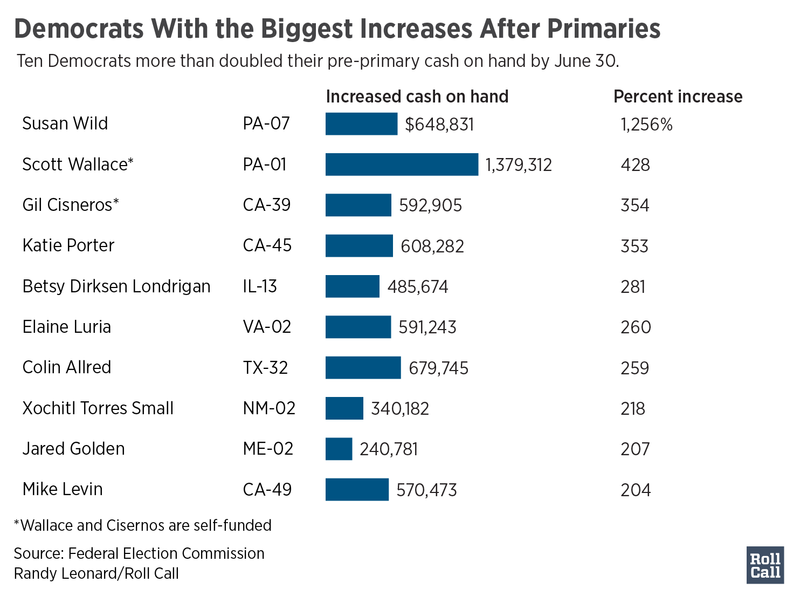 Besides Wild in Pennsylvania, other Democrats reporting big increases in their cash on hand since the pre-primary period include Katie Porter in California, Betsy Dirksen Londrigan in Illinois and Elaine Luria in Virginia. Self-funders Gil Cisneros in California and Scott Wallace in Pennsylvania also boosted their campaign coffers by four and five times, respectively. Wild is connected to other donors through groups such as the abortion rights group EMILY’s List and through the DCCC as a member of its Red to Blue program for top recruits. She also benefited from a $250,000 transfer from the House Victory Project, a joint fundraising committee formed by a group of big-dollar Democratic donors, according to The New York Times. It so far is funneling money to 11 House Democratic challengers. The new grass-roots organization Swing Left also transferred $33,000 in individual donations to Wild after she won the nomination. The group launched “district funds” last year to raise money to give Democratic nominees after their primaries. The group has so far transferred nearly $3 million to 57 different Democrats, according a Swing Left spokesperson. Swing Left and other groups will continue to help fundraise for Democrats, but Republicans don’t expect to be at a money disadvantage in the fall. While Democrats have raked in the campaign cash this cycle, GOP incumbents, with a few exceptions, typically have higher amounts of cash on hand meaning they will have plenty of money to spend.